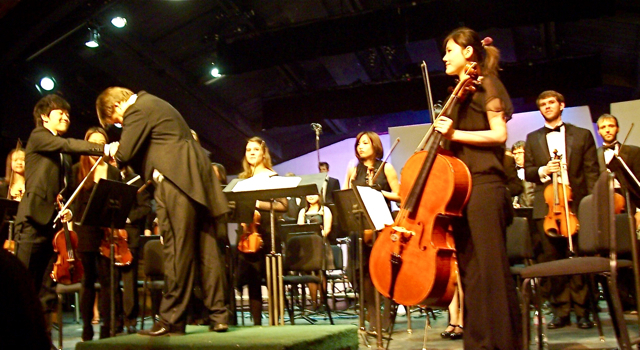 Last weekend’s Idyllwild Arts Academy Orchestra concert was without any special guest artist or fanfare, but it was wonderful nonetheless. It featured dances from Platee and Marosszek, and, after intermission, a Mother Goose Suite that showcased Kodaly’s interpretation of five familiar nursery rhymes. This concert comes on the heels of the academy’s last popular concert, “Peter and the Wolf,” by Prokofiev, which was narrated by humorist Harry Shearer. “So if you’re anywhere near a radio or the internet, be sure and catch the broadcast,” Askim said. He also mentioned that the arts academy orchestra has its Tschakovsky’s 5th Symphony release now on iTunes, which would make a perfect Christmas gift. Later, Askim thanked Gaylord Nichols for funding this and Saturday’s concert. And with that, Askim walked off the podium, joking that he would be at JoAn’s (an Idyllwild restaurant). 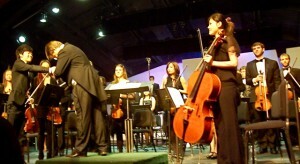 For the “Suite of Dances from Platee,” the orchestra took direction from Xiao, a first violin student. Throughout the three movements in the suite, the student orchestra sounded much larger then the 25 strings onstage. They were helped, in part, by college-level and professional musicians, including Mariya Andoniya Andonova, a bass player who now attends The Colburn School of Music in Los Angeles. Askim returned to the podium for the next piece, “Symphony No. 4 in C Minor,” by Franz Schubert. According to the program notes, Schubert completed this piece in 1816 at age 19, not much older than these students. The symphony is scored for strings, pairs of winds and timpani. It opens in a sober and serious mood, yet builds to show Shubert’s gift for melody. Ai-Ching, who plays viola, said that the first half of the concert was good, but she liked the music in the second half. “The Mother Goose Suites are worth listening to again,” said David, a music student, who had attended the concert the night before. He liked “The Mother Goose Suite” so much that he pursuaded his mother, who works in Idyllwild, to attend the second half after her shift. According to the program notes,Ravel was inspired by Perrault’s popular “Mother Goose” book collection and wrote a short suite for a piano duet, that was later expanded into a full ballet score. After a three-week Winter Break, the concerts will continue on Monday, Jan 17, with the ever-popular Piano Fest at 7:30 p.m. at Stephens Recital Hall. 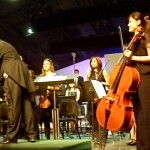 The next orchestra concert will be held on February 5 & 6. For more details, look to the Idyllwild Arts web site at www.idyllwildarts.org. This entry was posted on Wednesday, December 15th, 2010 at 4:12 pm and is filed under Idyllwild Arts Academy, Music. You can follow any responses to this entry through the RSS 2.0 feed. Both comments and pings are currently closed.